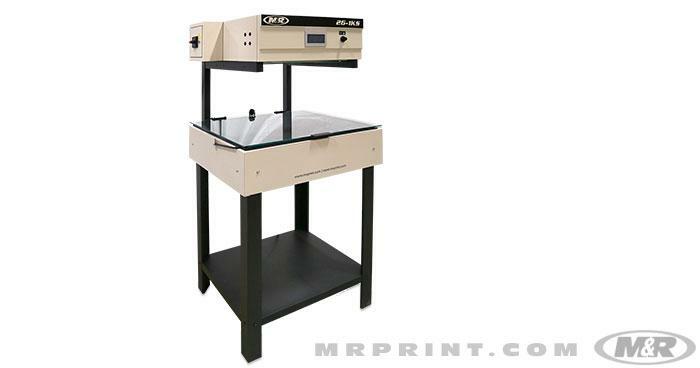 M&R’s wide variety of exposure and imaging units for screen printing includes NuArc screen exposure systems for textile screen printing and screen exposure units for graphic screen printing, and the world's first combined imaging/exposure system. 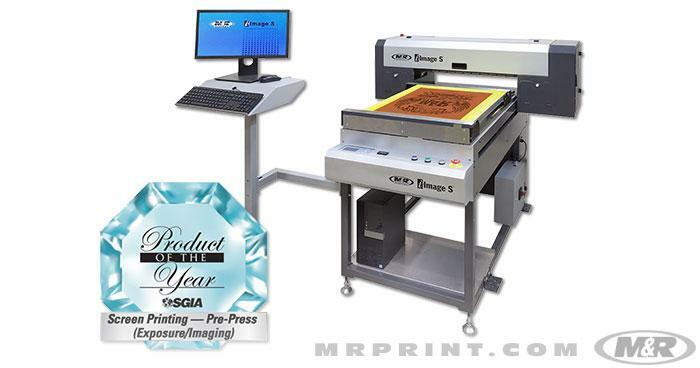 M&R’s i-Image S features the same software, printhead, output quality, and image area as the groundbreaking i-Image ST-36-1, but with a smaller footprint, exceptional pricing, and the ability to image up to 100 screens per shift, it’s the ideal choice for small-to-medium size print shops. i-Image S quickly generates opaque images up to 51 x 66 cm (20” x 26”) on screen frames up to 66 x 91 cm (26” x 36”). And it’s designed to fit through an 81 cm (32") doorway. 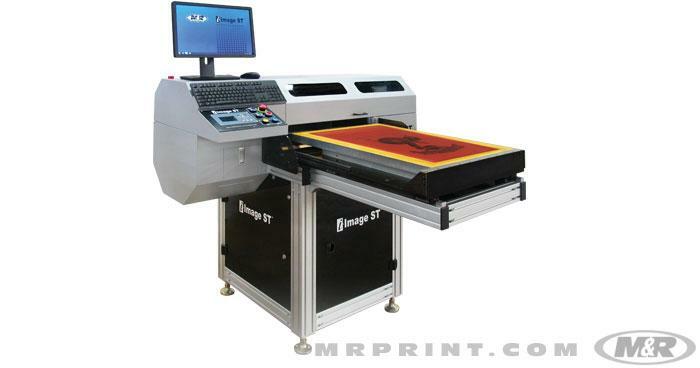 i-Image ST™ remains a popular choice among screen printers who want a computer-to-screen (CTS) imaging system, but who wish to continue to use their standalone exposure systems. it includes computer, monitor, and proprietary software that give operators complete control of print parameters, producing high-quality screen images at production-level speed. To optimize productivity, every CTS-generated screen is pre-registered for M&R’s Tri-Loc. i-Image STE I™ is the flagship of M&R’s i-Image Series of computer-to-screen (CTS) imaging and imaging/exposure systems. With its full-size built-in UV LED screen exposure panel, i-Image STE I offers the convenience of having CTS imaging and UV LED screen exposure in one machine. 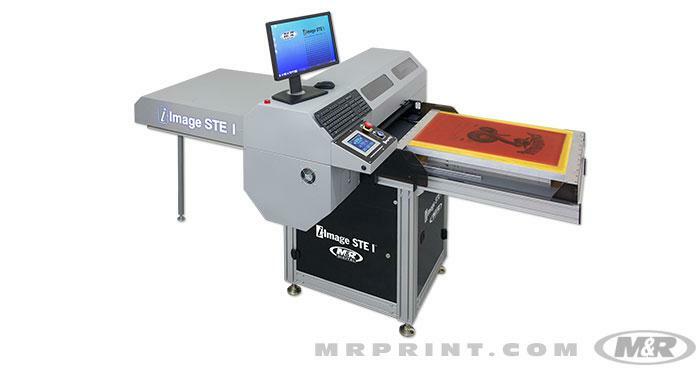 i-Image STE I doesn’t require a separate screen exposure unit—or the space one requires, and it dramatically reduces the time and effort required to prepare images for screen printing. To optimize productivity, every CTS-generated screen is pre-registered for M&R’s Tri-Loc. And M&R’s Tri-Sync™ System helps ensure perfect screen alignment on Tri-Loc registration frames. i-Image XE™ is M&R’s oversize version of i-Image STE, the world’s first all-in-one computer-to-screen (CTS) imaging and UV LED exposure system (US Patent Pending. European Patent Application No. 14721111.4). 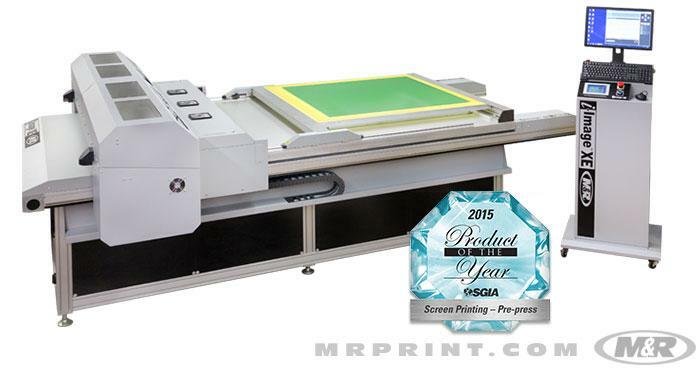 It’s ideal for imaging and exposing oversize screens for textile screen printing as well as for exposing and imaging multiple textile screens simultaneously. It’s also suitable for some graphics applications. By combining CTS imaging and UV LED screen exposure in one machine, M&R has dramatically reduced the time and effort required to prepare images for screen printing. 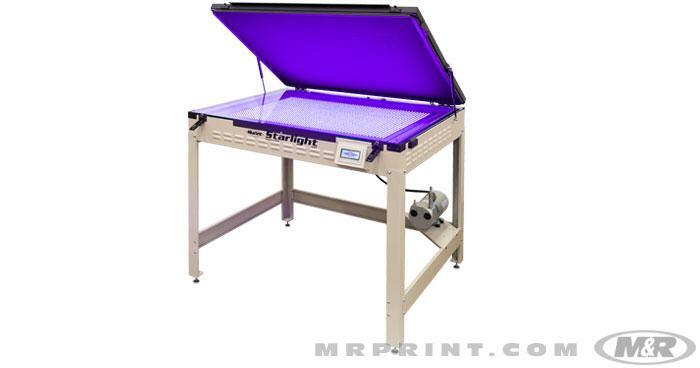 Starlight™ is NuArc’s versatile and affordable tabletop or stand-mounted UV LED screen exposure unit. It’s ideal for conventional exposures, and an optional CTS retrofit kit turns Starlight into a computer-to-screen (CTS) UV LED screen exposure system. Starlight's UV LEDs save energy costs, reduce screen exposure time, speed up production, and operate at far lower temperatures than metal-halide lamps. And, unlike expensive metal-halide bulbs that require replacement every year or two, Starlight's UV LED light source can last for decades. 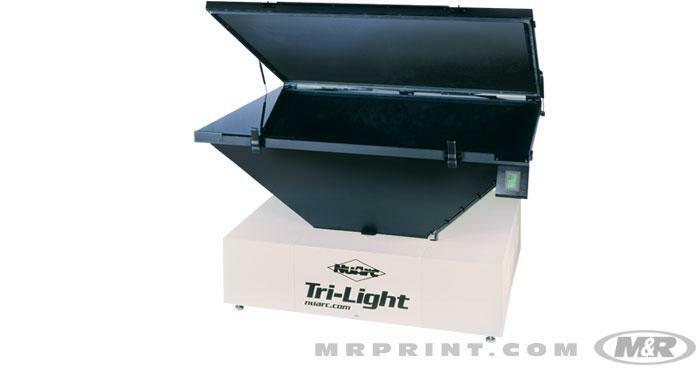 Versatile, affordable, and accurate, the First Light™ tabletop UV screen exposure system is perfect for startup manual screen printing shops and ideal for small screen printers looking to upgrade from home-made screen exposure units. First Light’s LED timer with digital readout ensures accurate screen exposure times, and the Light-Loc™ feature automatically turns off the screen exposure light source if the blanket frame is opened, allowing First Light to be located in light-safe screen-coating rooms. 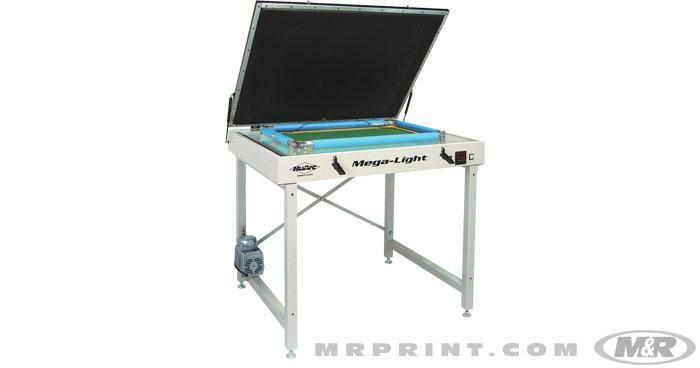 Available as a tabletop model or stand-mounted, the Mega-Light™ UV fluorescent screen exposure system is perfect for startup manual screen printing shops and ideal for small screen printers looking to upgrade from home-made screen exposure units. The LED timer with digital readout ensures accurate screen exposures and fast exposure times. 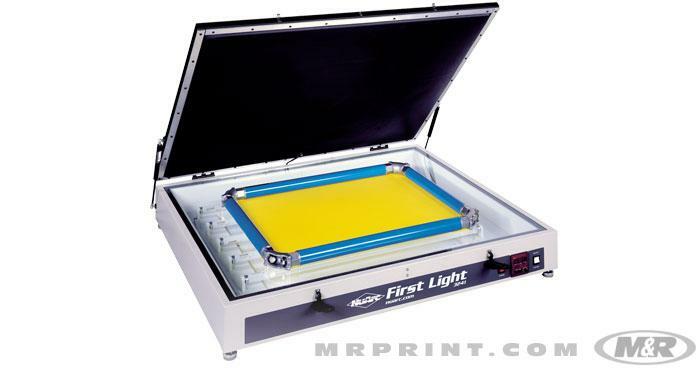 UV fluorescent screen exposure lamps excel on all emulsions, and the Light-Loc™ feature automatically turns off the screen exposure light source if the blanket frame is opened, allowing Mega-Light to be located in light-safe screen-coating rooms. The recently updated 26-1KS PLC is designed to ensure fast, consistent lithographic exposures and superior image reproduction on printing plates, color proofing materials, daylight films, and many other applications that require UV exposure with absolute contact. 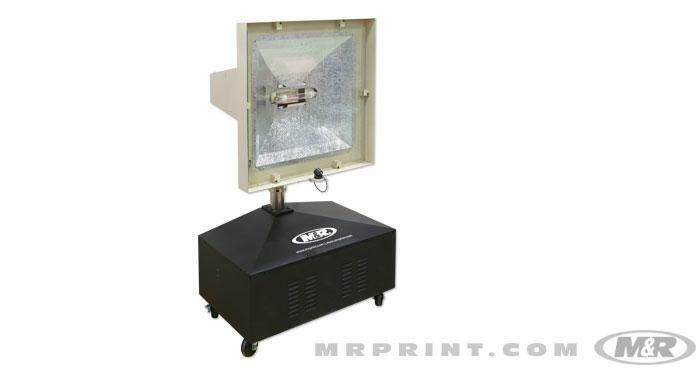 It combines a 1K instant-start multi-spectrum metal-halide exposure lamp with a vacuum frame and molded one-piece blanket housed in an all-steel cabinet. The 26-1KS PLC is a complete, easy-to-use lithographic exposure system with an energy-efficient power supply that provides more power and light than competing models with higher wattages.